Front Drip Tray Trim: Cut the decorative trim to the length of the board you cut PLUS 2x the thickness (depth) of the trim. MEASURE TWICE CUT ONCE! 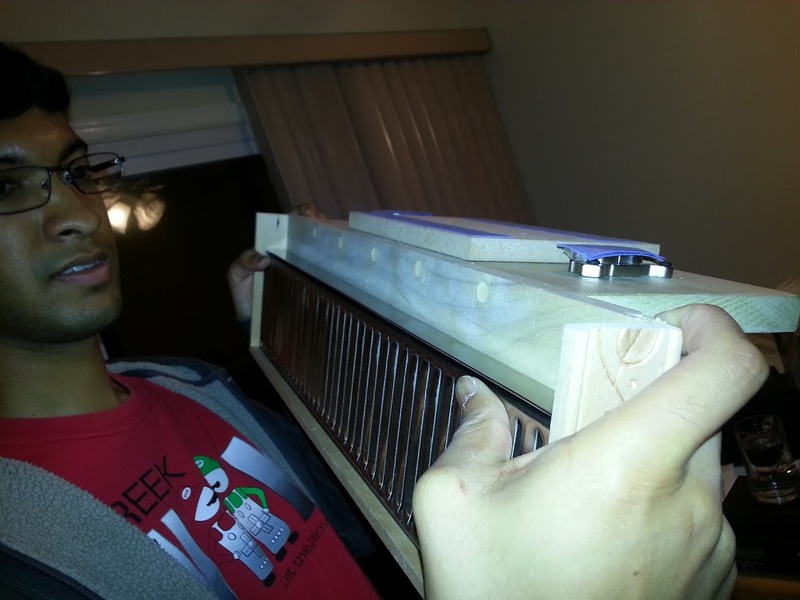 For instance your front trim piece for the 19″ drip tray should be Length of drip tray + .25″ +.25″. This will allow the trim to hang over the length and cover the side piece of the drip tray.Note: If you accidentally cut this to the exact width of the drip tray, don’t fret. You will need this piece to fill the gap behind the drip tray. Side Drip Tray Trim: Cut the decorative trim to the width of the drip trap base depth. This should be 5.5″ inches! (a 6″x.5″ is actually 5.5″x.5″) You will need TWO of these (left and right side trims). You can optionally cut this to 6 inches to accommodate for the depth of the magnets…I choose not to because I didn’t think of it at the time. Assemble upper Drip Tray Mount (Attach Trim to Wooden Drip Tray Base): The trim can now be attached to the base. I used Wood Glue and Brads. 2 brads on the sides and 4 on the front. I used a special tool to push the brad heads below the surface of the wood and filled with wood putty. Be sure to have a damp paper towel to clean up excess putty and wood glue. Drink beer now. You’re getting there. Create the Wooden L Bracket (Attaching the upper and lower portions of the wooden trip tray mount): Attach the upper drip tray mount to the 1’4″ of 6×1 Poplar Wood. I used 5 screws, evenly spaced to do this. I centered it and pre drilled all holes. 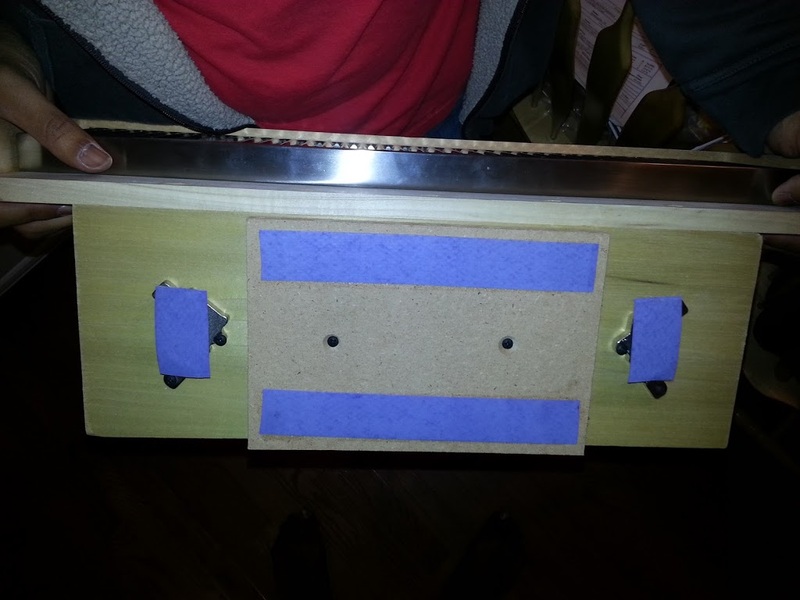 Use the 1″ wood screws here and be sure to counter sink them. You can fill the countersunk screws with wood putty.Note: The length of wood that attaches to the kegerator should be >= the length that the drip tray extends away from the kegerator. simple physics, so you can negate the torque of the weights/load acting as a lever on your magnets! Rear plank torque extension plate: Attach approximately 6-8 inches of the excess 6x.5 (cut to length) to the center of the rear of the lower drip tray. Use your counter sink and 3/4″ screws here. This piece is crucial for stability of the mount. it ensures that additional grip is provided to the surface and minimizes the pressure points created by your magnets. Attach magnets evenly in the space left on the rear of the bracket. I placed them two inches from the end of this rear portion of the mount. User you 3/4″ screws here. I had to drill out the magnet bracket holes to get the screws to work. If your magnets don’t have mounting holes or you couldn’t acquire these old magnets…attach you alternative 1/2″ magnets with epoxy or gorilla glue…do not get it on the surface that will contact the fridge! Follow manufacturers dry times for that option. NO MATTER what magnets you use…they must be .5 inches…they have to be the same depth as the rear plan extension.Note: The magnet placement should be towards the top of the empty space…i did centered…which is much less efficient…but i still got 10# on it…probably don’t need more than that though! Mount to fridge and test fitment…guess and check here…if magnets and rear plank make contact, you should be good to go for weight testing! Don’t use beer in case you totally mess it up. After all is good… pour a beer…rest it on your weight tested drip tray and admire your almost completed work. 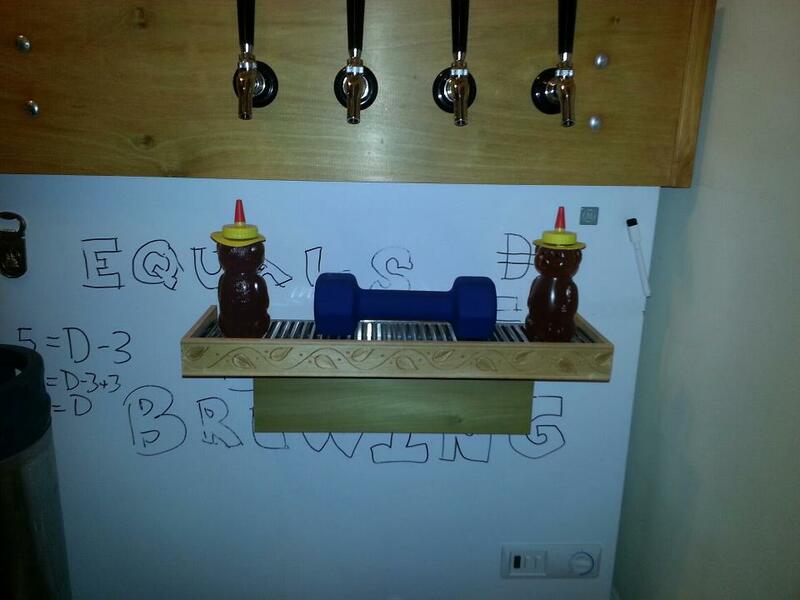 Take the tray off the fridge…with your beer in hand go outside and Stain or paint your drip tray as needed. Thanks for sharing. Great detail in the images. Keep up the great work.